I have finally been paid! And even better than that I’ve been paid by both jobs. Normally I get paid by cheque from one job and that has cleared, and mostly been spent, by the time my pay from my other job comes into the bank but this month has been messed up because of the bank holiday. It was so nice to finally be able to do things like stock up on animal feed and human feed as well. As I’d just been paid I went into the whole food shop as well, to stock up on silly little things that are nice to have but aren’t really needed. This time I found some ‘wild nettle cordial’, it’s good and from the ingredients looks really easy to make so I think I will have a go at it. It should work with just an elder flower cordial recipe with nettles instead of elder. Well, lately my blogging has been very patchy to say the least, partly because it’s summer and that is a very busy time of year for us food producers, add to that the fact that for the past 5 weeks I have been working two part-time jobs (I don’t know how I ever managed to do anything when I worked full-time… yes I do I just didn’t) and it makes it an extra busy time of year and then added to that is the joys of computer problems, I think it has been re-formatted twice now, maybe more, blogging has just not proved to be an easy task. But I have been here in spirit, which I hope makes up for it a little bit, and have even been making lists about what I wanted to write about each day in the hope that I would be able to (apart from the fact that I have lost both lists) up-date everything. Now that the school summer are almost over I should have a little bit more time so will be able to write more. I was working today but have had quite a busy freecycle day as well. There was a want post a few days ago for someone who wanted jars for pickling so I arranged that she could have some of the boxes full of jars that I got from LETS a while ago. Not all the jars are suitable for what I want and what goes around comes around doesn’t it? We’d meet a few times, during the winter I often offer sacks of manure on there and I often ask for sacks as well. Work is half way between both of us so we arrange to meet there, she bought me some sacks she’d saved for me and I bought her the jars. I also asked for a rabbit hutch a few miles from work and got it. It’s a really good hutch and looks like its hardly been used. Also, yesterday on the way to picking the chicks up me and Mother picked up some soap nuts from Mrs Green, very interesting looking things. Five weeks ago Mother ordered some more Ross Cobbs, the lady in Gloucester needed a minimum order of 50 chicks and as we’re only have 30 we were going to have to wait six weeks but she would let us know if any became available sooner. Well she did get some sooner so me and Rhys now have 30 chicks in the brooder in our room. The lady who sales them is in a very odd place in Gloucester, on the edge of a disused business estate, but I guess that just proves the point that you can go some way to producing your own food anywhere. It’s my day off today, I got up this morning and got distracted by the vegetable garden on the way down to the goats (in the end Rhys went and feed them instead) one of the boxes that’s had potatoes growing in it was looking very empty of plant so I pull at one of the old steams and up came a load of potatoes! I then of course had to sit there, digging around on the top of the box, with my bare hands as there just wasn’t time to go and get something else to use of course, fishing out potatoes. They look really good. Ok, me and Rhys got back from the wedding on Friday, the driving wasn’t to bad (very long.) On the way there and back we ended up stopping at the same services as me and mother picked up Abna from a few years ago, Felix grandfather. When we got there we went out for dinner with everyone else who was staying for the wedding. We don’t often go out for meals, and even then it’s normally chips in a pub if we do. I had a potato and broccoli cream bake which was really good. It was really odd staying in a hotel, almost all the things that I do to pass time are outside, and if they’re not outside then it’s things that need an outside first to make them happen. I really would be a completely different person if I’d been bought up in a house with a smaller garden, or even worst in a house, in a town with no garden. It amazes me that loads of people not only live like that but seem to be happy with it. The wedding was the next day but not until 3pm. A few days before we left I had been offered a male goat in Kent (I need a new male goat as I want to put my last years kid in kid this year but not to her dad), it was all very odd, not in a bad way just that I would never drive to Kent to see a male goat who I might not like or might not be suitable when I get there but because I was going to be an hours drive away any way, and I never go anywhere, I could go and see him. Like it was meant to happen. Me and Rhys killed some time going into town to find a library to get a route finder to the goat and then looked round a few charity shops. The wedding was nice and so was the reception, it had looked like it was going to pour with rain at any minute all morning but it brighten-up and turned into a really nice afternoon. The reception was in a big old-ish looking building that was mostly covered by vines of some sort right by a steam railway. The vegetarian main course was a sort of puff-pastry with chopped tomatoes and courgette and onion with basically tinned tomato soup as a sauce, I’m going to try making my own version. The next morning everyboby who was staying went out for breakfast in some sort of chain ‘pub’, it was horrible, the whole place smelt of weeks old spilt drinks and it was dark amd would have been full of smoke if it wasn’t for the smoking ban. The greengrocers next door was good though, it had loads of fruit I didn’t even know how you’d eat let alone what it was called. Saturday I was working at a ‘play festival’ for the museum, I took a load of the handling collection for children to look at and play with. It poured with rain all day, but still over 600 children came. Rhys and a friend had a gig in the evening which I was meant to take them too but I had a car crash on the way there. No one was hurt luckly but both cars have had to be towed. The other car was on the wrong side of the road passing some parked cars on a little bit of a bend and when I saw it and breaked the car just aquaplaned into the other. I’ve spent the whole of today feeling stressed, sorry for myself and not getting much done. Mother says it’s stock. 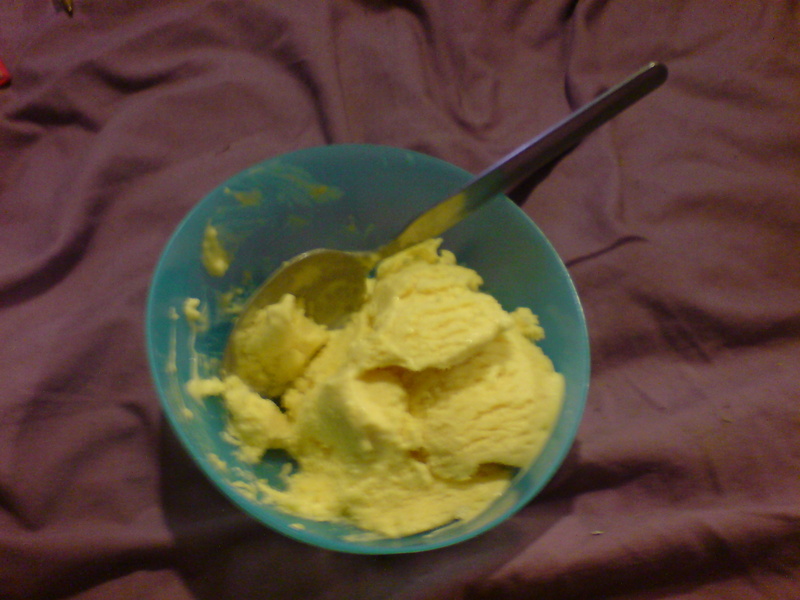 Mother made mango and peach ice cream from Primrose cream today, it’s really nice. Me and Rhys are going away for a few days for a friends wedding, it’ll be my first time driving on the motorway. We’re going to make them a hamper as a gift again, this time I will try to remember to take photos before giving it away, but they’re going on honeymoon for a couple of weeks so we’ll make it up and take it to them when they get back so nothing goes off or gets wasted. I sorted out loads of things to take to the LETS meeting that was tonight but there was still things to sort out before going tomorrow tonight so I didn’t end up going, it’s a shame as I was really looking forward to it but the next meeting is in my favourite pub so I’ll make sure I go to that one. Thank you Eat the Seasons!